Manufacturing sales fell 0.4% to $58.6 billion in August, following three consecutive monthly increases. The decline was mainly due to lower motor vehicle sales. Excluding this industry, manufacturing sales rose 0.4% in August. Sales were down in 7 of 21 industries, representing 50.9% of the Canadian manufacturing sector. After taking price changes into account, the volume of sales in the manufacturing sector edged down 0.3% in August. Sales of motor vehicles fell 8.3% to $4.9 billion in August, following two consecutive monthly increases. The decline was mostly attributable to lower production due to atypical shutdowns in some assembly plants in August. 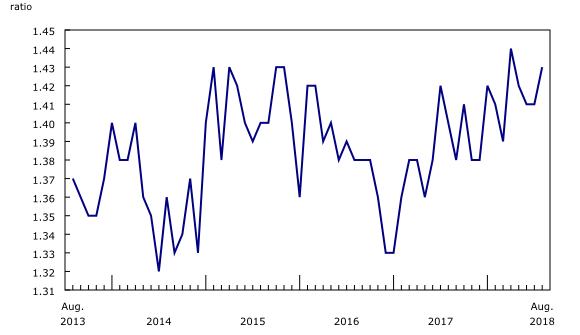 In constant dollars, motor vehicle sales fell 8.4%, which shows that the decrease in current dollars mainly reflected a drop in sales volumes rather than lower prices in the industry. Primary metal industry sales fell 2.9% to $4.4 billion in August, a third consecutive monthy decline. The decrease in August reflected lower sales in the non-ferrous metal (except aluminum) production and processing industry. Conversely, seasonally adjusted sales in the iron and steel mills and ferro-alloy manufacturing, steel product manufacturing, and alumina and aluminum production and processing industries grew in August. Sales in the wood product (-3.4%) and food (-0.6%) industries also fell in August. These decreases in current dollars were partially offset by increases in the aerospace product and parts (+13.5%), plastic and rubber product (+3.8%), machinery (+2.0%) and chemical product (+1.1%) industries. Sales were down in three provinces in August, with Ontario posting the largest dollar decrease. 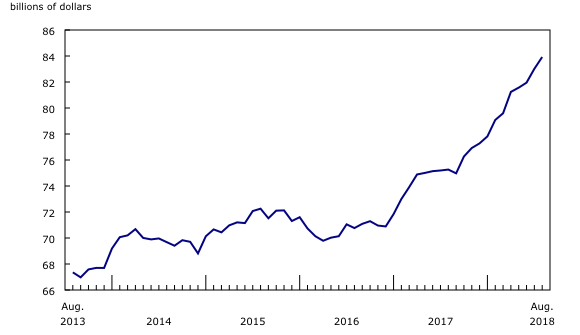 After two straight monthly increases, sales in Ontario fell 2.0% to $26.6 billion. The decline was mainly attributable to lower sales in the motor vehicle (-8.9%), primary metal (-8.4%) and motor vehicle parts (-1.8%) industries. In Alberta, sales fell 0.8% to $6.6 billion, following three consecutive monthly increases. Most of the decrease stemmed from lower sales in the petroleum and coal products (-3.5%), electrical equipment, appliance and component (-24.6%) and primary metal (-9.2%) industries. The largest monthly increase was in Quebec, where sales rose 1.3% to $14.2 billion. The gain was mainly attributable to an 18.9% increase in the aerospace product and parts industry and, to a lesser extent, gains in the plastic and rubber product (+8.6%), computer and electronic product (+12.2%) and petroleum and coal product (+3.4%) industries. Inventory levels rose 1.1% to $83.9 billion in August. Inventory increased in 14 of 21 industries, with the largest gains in transportation equipment (+3.4%), food (+1.9%) and plastic and rubber product (+5.6%). These increases were partially offset by lower inventory levels in the primary metal (-1.4%) and wood products (-2.3%) industries. The inventory-to-sales ratio rose from 1.41 in July to 1.43 in August. The ratio measures the time, in months, that would be required to exhaust inventories if sales were to remain at their current level. In August, unfilled orders rose 0.8% to $94.8 billion, after edging down 0.2% in July. Most of the gain came from a 0.8% increase in the aerospace product and parts industry. Unfilled orders were also up in the computer and electronic product and the fabricated metal product industries. After two consecutive monthly decreases, new orders were up 1.1% to $59.3 billion in August. 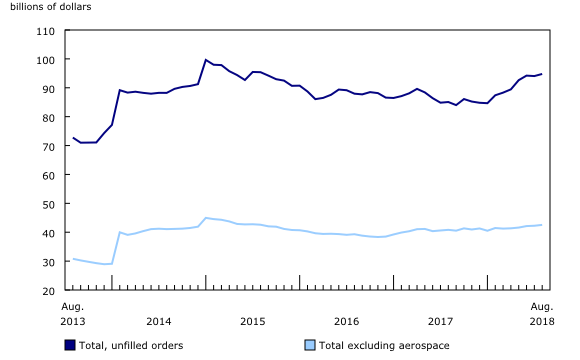 An increase in new orders in the aerospace product and parts and machinery industries were behind this gain. The capacity utilization rate (not seasonally adjusted) of the manufacturing sector edged up 0.7 percentage points, from 79.5% in July to 80.2% in August. 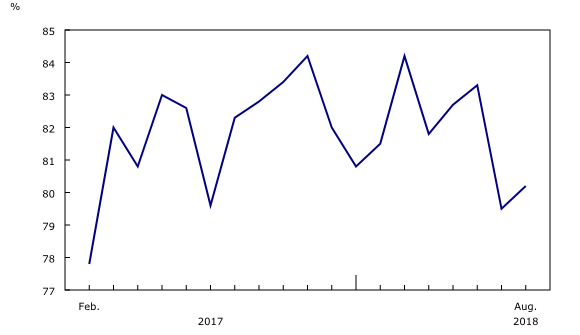 Following a 14.6 percentage point decline in July, the capacity utilization rate for the transportation industry increased from 73.4% in July to 81.5% in August. Shutdowns at several auto manufacturing plants were responsible for the decrease in July. The capacity utilization rate of food manufacturers fell 2.2 percentage points to 81.0% in August. This decrease was attributable to lower production in most food industries. The capacity utilization rate of the primary metal industry, which includes aluminum and steel, edged down 0.3 percentage points to 77.8% in August. For information on seasonal adjustment, see Seasonally adjusted data – Frequently asked questions. For information on trend-cycle data, see Trend-cycle estimates — Frequently asked questions. 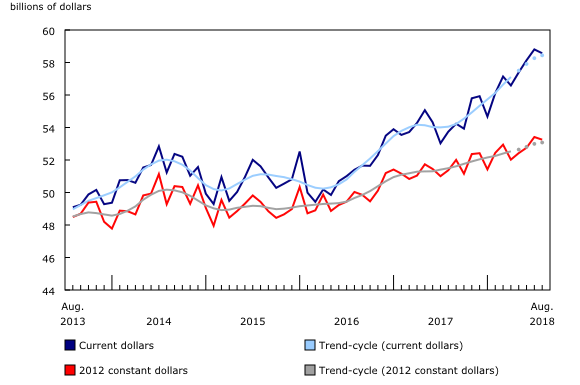 For sales, based on the assumption that they occur throughout the month, the average monthly exchange rate for the reference month established by the Bank of Canada is used for the conversion. The monthly average exchange rate is available in table 33-10-0163-01. Inventories and unfilled orders are reported at the end of the reference period. For most respondents, the noon spot exchange rate on the last working day of the month is used for the conversion of these variables. However, some manufacturers choose to report their data as of a day other than the last day of the month. In these instances, the daily average exchange rate on the day selected by the respondent is used. Note that because of exchange rate fluctuations, the daily average exchange rate on the day selected by the respondent can differ from both the exchange rate on the last working day of the month and the monthly average exchange rate. Daily average exchange rate data are available in table 33-10-0036-01. Real-time data tables 16-10-0118-01, 16-10-0119-01, 16-10-0014-01 and 16-10-0015-01 will be updated on October 29. Data from the Monthly Survey of Manufacturing for September will be released on November 16.